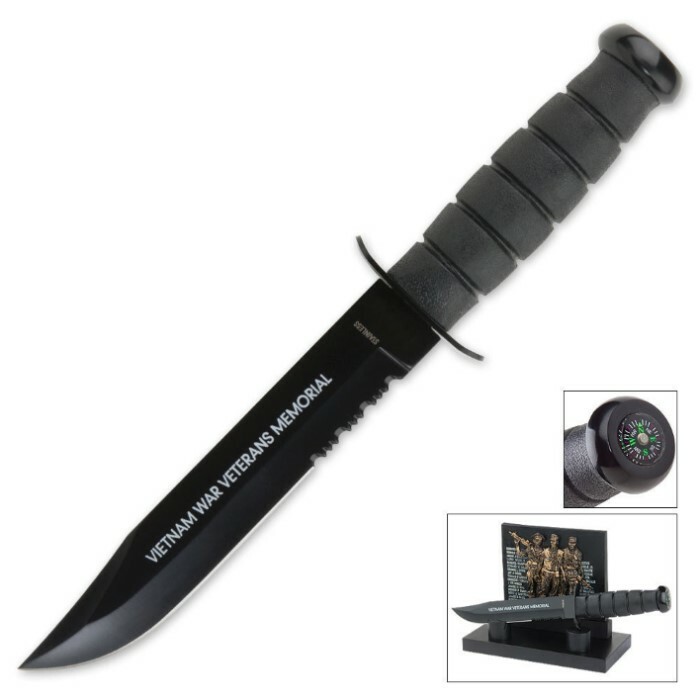 Vietnam Memorial Wall Knife | BUDK.com - Knives & Swords At The Lowest Prices! If you've ever made the trek to see the Vietnam War Memorial, you know it's breathtaking. So, remember those fallen and take home a little piece of that history. This is a fine knife, and display of Patriotism. Not only did I order one for myself, but 3 more for V.N. Veteran friends of mine. This knife/display is not only patriotic, but it is DIGNIFIED........V.N. veteran or not! 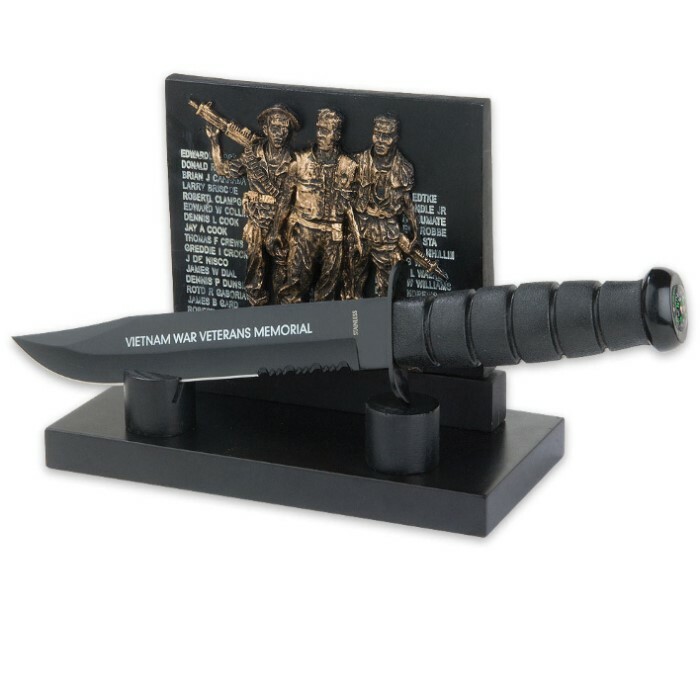 This knife/display makes a great addition to any collection....especially if you are a Military Vet. Thank you BudK for making this available.......and offering it at an attractive price. Beautiful knife. well made, stock edge is quite sharp, and compass works flawlessly. The reason I gave it four stars instead of 5 was because the soldiers on the display had almost NO gold paint on them whatsoever. I was slightly disappointed that the base was wooden, but its more than worth the price, I probably would've paid 60$ for the knife alone!! Planning to give this to my former brother-in-law. He was a Vietnam vet. This will make a great Christmas gift. Thanks again Bud K. A beautiful display piece. The first Vietnam Memorial Knife i bought i ended up donating it to The American Legion were i am the Adjutant. The Club used it for a raffle to raise money to help the Club. It was a big hit with not only the Vietnam Veterans but with all the Veterans and quest that came into the Club. The Club was able to raise quite a bit of money with this raffle that helped the Club at a hard time.